3rd floor, 1 bedroom, and 1-bath Forest Beach Villa with a tennis court, lagoon, and pool view. This coastal influenced and newly renovated 1 bedroom, 1 bath end unit villa welcomes you with the comfort and tranquility most travelers seek to find. Renovation includes new paint, flooring, lighting and all furnishings. Forest Beach Villas are directly across the street from the beautiful Atlantic Ocean with wide sandy beaches. 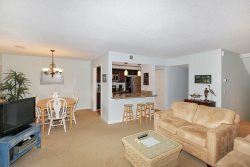 This well maintained condo community has elevators and under building parking, 2 tennis courts and swimming pool. The central location near Coligny Plaza puts guests within easy walking distance to many coffee shops, restaurants, grocery and shopping along with miles of paved bike paths. Upon entering the villa, the hardwood style flooring leads you across the living room to the expansive 12 foot wall of glass with sliding doors to the balcony. Relax on the private balcony after a day at the beach. A chaise and table with 4 chairs is a great place to unwind while enjoying views of the tennis courts, lagoon and swimming pool. Back inside, the living room area consists of comfortable seating with loveseat and sofa with chaise that converts to a queen size sleeper with upgraded mattress. Large 55 inch TV comes with surround sound speakers, DVR and DVD player. Comfortable dining area provides seating for 4 with additional seating with matching bar chairs at the granite breakfast counter. The kitchen has updated granite and is bright and fully equipped to meet all of your cooking needs. A full size washer and dryer in the kitchen alcove adds to the total package this unit offers. Large roomy Master bedroom features all new furniture including king size bed and new mattress. Nightstands have USB ports and outlets to charge all of your electronic devices. Wall mounted 40 inch TV swings out to allow for great bedtime TV viewing. Private bath has granite counters and tile flooring with tub/shower combo. Forest Beach Villas are in the South Forest Beach area just across the street from the ocean and have free tennis and an on-site pool, as well as a convenient short walk to the shops and restaurants of Coligny Plaza. All beach distances are measured from the center of the complex. Excellent, we only had a few questions and they had prompt and concise answers. The property was excellent. It looked exactly like the pictures and was bigger than expected. Perfect place for 2 and as close to the beach as you could ask without actually paying to stay on the beach. Pool was well taken care of and plenty of chairs. Location! So close to the beach. Available covered parking was an unexpected extra. The two ladies with whom I dealt were both extremely courteous, efficient, and professional. All my questions were addressed in a very rapid manner and I could not have been more pleased with their help. Great job! Absolutely delightful experience! Well worth the money. The villa in which we stayed was immaculate and extremely well equipped with virtually every imaginable utensil and appliance. It was roomy, quiet, and extremely comfortable. Great vacation experience and we greatly enjoyed our time there. Great location very clean would stay again and recommend to friends and family! Overall the property is a nice place and very close to the beach and Coligney.The bed was comfortable. . I do love Forest Beach Villas it is very convenient and the grounds are pristeen.